My very good blogging friend Booknut and I, had thought about this idea for a post long before the tour came to be, however we felt it prefect to showcase our Survival Guide in celebration and to kick start the tour. So without further ado. I am sure by now everyone has heard me talk about the emotional roller coasters Elise Kova has put me and her readers through. If not, here’s a brief little summary. Elise has made my heart feel many emotions throughout the entire series. I have felt happiness to the point of having my heart explode. However with this happiness came along its equal opposite, sadness. I believe I have actually cried myself an ocean. An ocean filled with my tears so that I could go rowing on and cry some more just merely thinking about the characters and what has happened to them. For example, when I got my ebook of Water’s Wrath, I could've read any chapter, but nope, I decided to go to chapter 19. This is the chapter that I still cry about at times just by mere thought. Yes, Elise has put my heart through treacherous times, however that doesn’t make me want her books any less. In truth it is probably one of the reasons why I have fallen in love with this series so much. Once, during one of our fangirling sessions over the series my dear blogger friend Booknut and I were discussing how we would ever survive after reading one of the books. At that point we both thought of the same thing. 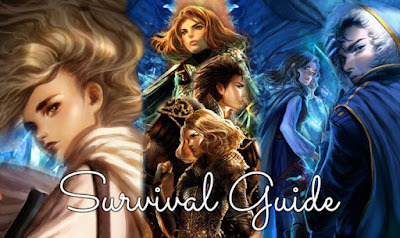 Why not make a survival guide for current and future readers to come. A way to make the read a little more easier to survive the boat load of feels that you experience. If you are a reader of her books then you know exactly what I am talking about, if not, well I am sure this little survival guide will make the heartbreak a little easier whilst picking up her books. I’ll be giving you my five tips and then at the bottom of my post will be the link to BookNut’s five tips and the conclusion to our fun little post. Tip #1: FOOOD. Well not just food, preferable sweets. It’s always super nice after a heartbreaking event to stuff your face with something divine. It’s not only comforting, but it’s also distracting. You see, as you're biting into the chocolate cake, or nibbling on that piece of chocolate, it takes your mind off the heartbreak and sorrow Elise inflected in the first place. My personal favourite is nibbling on some chocolate, I highly believe that you could never go wrong with some chocolate. Tip #2: MUSIC. I know of several amazing playlists out there that will mend my broken heart. Music in itself takes me to another world just by listening to it. I get lost in the music and lyrics, and to me, it is one of the best ways to surviving Elise’s books. I know that whenever I have finished a heart wrenching chapter and just can’t continue because I am blurry eyed I turn to my music. Another great thing about music is that it can set the mood depending on the beat or rhythm. We, as listeners can get a variety of feelings from music itself. ALSO if you are in the mood to continue to feel like you are in the Air Awakens world, Elise has her book playlists as well (Air Awakens, Fire Falling, Earth’s End, Water’s Wrath). Tip #3: Another thing I really like doing in order to get over a very emotional thing, is drawing or creating artwork. Now usually my muse is filled when one of my emotions is overwhelmingly taking over. Elise does just the trick with her writing to usually fulfill this emotional status. I often find myself quite inspired after reading a chapter of one of her books. So I highly suggest drawing away your emotions. It works quite nicely and it’s easy to forget the heavy impact of emotions forced upon you. Tip #4: Rereading happy times. If something terribly drastic and saddening occurs in Elise Kova’s book I tend to find a page that made me feel happy. OR I find a page with a gushy, swoon worthy moment and reread that a couple thousand times. The good scenes makes surviving possible. Concur the sad feels with the happy swoony feels. Tip #5: Pinterest and or Tumblr. By going on these social media sites it allows you to get tangled in the endless web know as the interweb (internet). I highly believe that it is very easy to get lost on Tumblr and pinterest. Plus this could be a good thing because it’ll take your mind off the pain signals your heart is giving out due to Elise’s books. ALSO you can always find happy things that remind you of the happy times that occur in Elise’s books. I personally love doing this one as well.